The next AGM will take place on Thursday 30th March at Roseholme, Golwgydre Lane, starting at 7pm. Everybody is welcome or send comments to the secretary if you aren’t going to be able to make it. 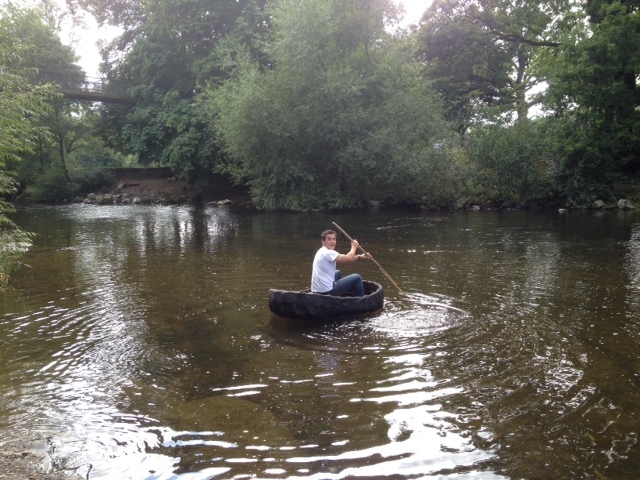 Following the very successful Custodians stand at the Food Festival some of the more intrepid visitors from our twin town, Les Herbiers, were introduced to the wonderful art of the coracle. Paula demonstrated the technique then let them loose on the Severn. With a few mishaps they did well and the only one who got wet was Paula rescuing Daniel Charrier off the rocks. The photo shows his son, Martin, who is obviously a natural. Another memory of Newtown for them to take back to France. 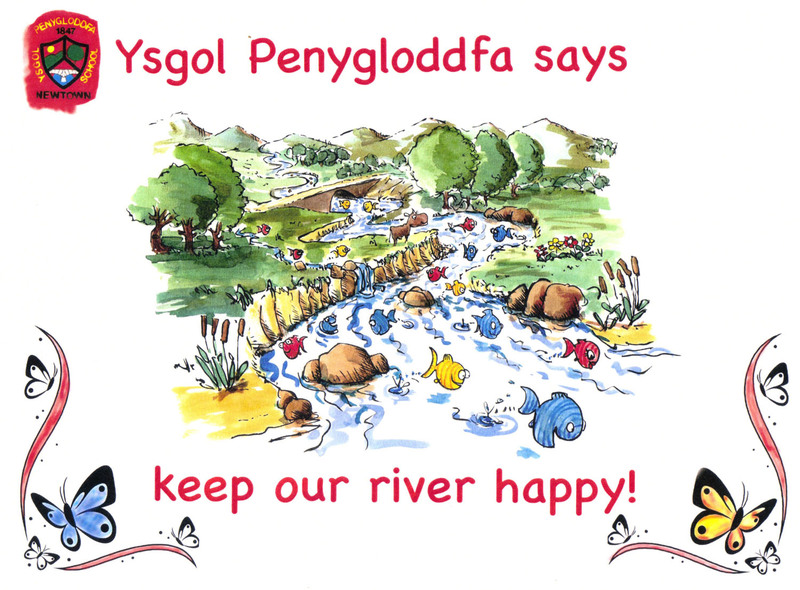 I recently had a meeting with staff at the Penygloddfa school in Newtown to discuss possible involvement of the pupils in the activities of the River Severn Custodians. Unfortunately as it was almost the end of the school term it was not possible to talk to the pupils but I will be talking to the whole school when they return in early September. They did, however, prepare some posters that we intend to use at the Food Festival. The one below was, I believe, prepared by one of the staff but we do also have a selection of ones made by the children. 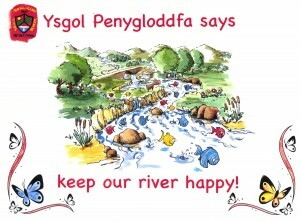 Hopefully, we can get the children interested and involved with the river and the Custodians. I am pleased to announce that the River Severn Custodians will be having a stall at the Carnival on the 14th of June 2014. This year, we thought that it would be interesting to get young people involved with the river environment by way of a photo competition, which will be open to anyone up to and including 16 years of age. The photo can be taken with a digital camera or mobile phone etc. and emailed to the address shown below. Any subject that involves the river can be used, e.g. wildlife, people enjoying the river, views of the river, your dog playing in the water or whatever you feel would make a good photo. A panel of Judges will decide the winning photo(s) on the day of the Carnival and there are prizes to be won. This is a fun competition and therefore we need to keep the rules simple. 1. You must be 16 years of age or younger to enter. 2. The picture must be taken along the River Severn between Mochdre Brook (Vaynor) and Penarth Weir. 3. The River Severn must appear somewhere as part of the photograph. 4. Email your entry to secretary@riverseverncustodians.co.uk. Include your name, age and type of camera used. 5. The Judges decision will be final. 6. Closing date for entries is 12th of June 2014. The river can be a dangerous place as well as an enjoyable one – please take care out there. If photographing specific people that you don’t know, please ask if they are willing to be photographed. (Some people do not like having their photo taken). Please take care not to damage property or disturb wildlife when photographing. Enjoy the competition and have fun. 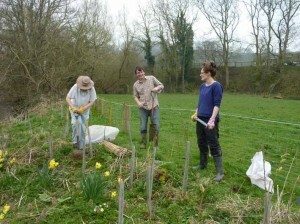 Today we completed the tree planting at Pant Farm, Aberbechan started at a previous session by volunteers. This was organised by Severn Rivers Trust with trees from the Woodland Trust and is intended to act as a wildlife haven and protect the banks of the brook. 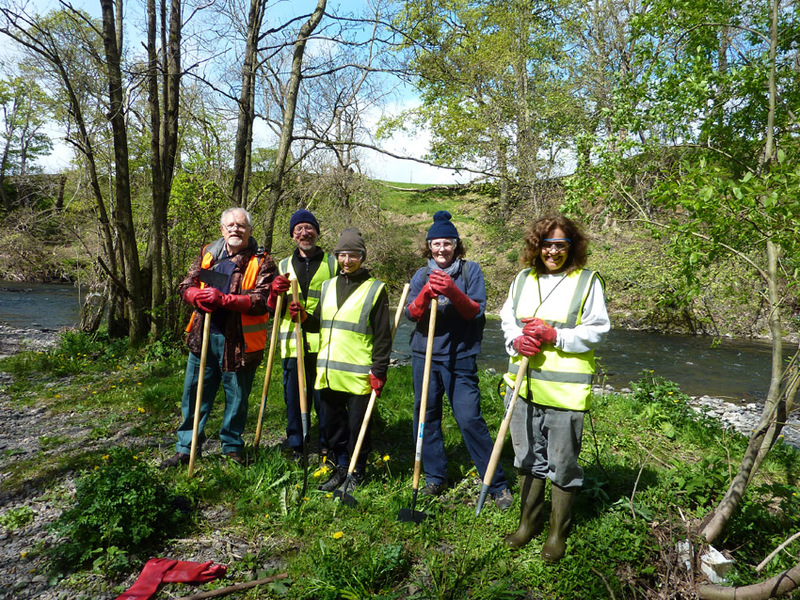 At today’s event were Lisa Barlow and Peter Powell of the Severn Rivers Trust and Judi Deakin and Mike Davies from the Severn River Custodians. 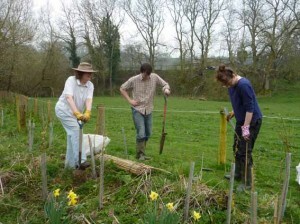 The previous planting was by Lisa, Judi and Liz Hinkley, Custodian. A total of about 300 trees have been planting, various varieties of willow and thorn, and each tree is protected with plastic collars, as can be seen in the following photos. We now have some important dates. The Newtown Carnival will be on 14th June, 2014. The Food and Drink Festival will be on the 6th and 7th of September, 2014 and there is a meeting on 14th April to discuss ideas for the Food Festival. This will be in the Council Chambers between 4 and 6 pm, come if you can. If you can’t come to this meeting but have some suggestions, please let me have them. The Custodians plan to participate in both the Carnival and the Food Festival and will have a stall at each event, maybe with some river activities. Plan to take part and look out for meetings prior to these important events. Since you haven’t heard much from us lately you might think that we have gone into hibernation. 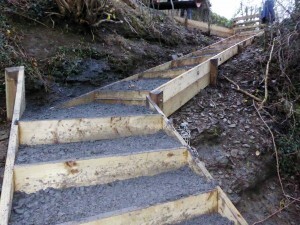 This is not so, although there is a lot less practical work going on at this time of year. A few things have, however, been going on in the background so I thought was timely to bring you up to date. There is a planning application in by PCC relating to the Kirkhamstead Depot that might reduce or eliminate possible river contamination. See post in this blog. Paula and I have presented a talk on the river, with emphasis on the Custodians, to the Newtown U3A, the Montgomery Energy Group and tomorrow will talk to the Newtown Thursday Group. This should help keep awareness of the group and, hopefully, lead to new members. I have been back in touch with PCC regarding permission to install bird and bat boxes on some of their trees along the river. I’ll let you know when this activity can begin. 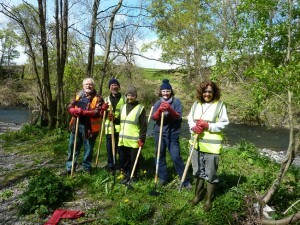 Lisa of the Severn Rivers Trust organised a get together of river groups in Welshpool and this was well attended. If I’ve missed any relevant activities please let me know or post to the blog. 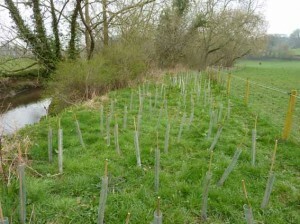 Don’t forget, this blog is your easiest mechanism to post observation, comments relating to the river. It would be nice to see more people involved in this resource. Finally, belated New Years’ greetings to you all. This is a delightful circular walk starting out along the river to the Mochdre Brook. If you are lucky, you may see otters, and a variety of birds, trees and plants (hopefully not including the Giant Hogweed). Give it a try and post your opinions or comments here.